review will help you to decide whether Jimdo fit for you or not. You will get a clear idea of when to and when NOT to use Jimdo. At the end of every section, you can see a Clear list of Jimdo Pros & Cons. Jimdo – Is It Really a Good Company? Before taking any web-based services, you should know whether the company is good or bad. Because your, all website information will be stored in your hosted company. Let’s see how many people are using and how many customers are satisfied etc. How Many People Are Using Jimdo Website Builder? If you know how many people are using a service, then you can assume how much you can believe the company. If more users are using a service, then more bugs are fixed and more discussions & help you can get, If you are a beginner, then you should not buy a service with very fewer users. (But Sometimes the most popular services may not fit for you). Let’s check the monthly active users. Don’t leave..! Checking Jimdo number of users or customers will not tell you whether Jimdo fit for your needs. Numbers just represents how popular it is. Continue to read to know Jimdo real value for you. More than 40 Million people are visiting Jimdo. This is a good number. you no need to worry about Jimdo community. But are they renewing their plan with satisfaction? To know continue to read. Jimdo Customer Satisfaction – Are Its Users Leaving Or Continuing? you should know whether its customers are satisfied or not. Because there is so many scam website builder make you happy at the beginning. But after you build everything with hard work, they will raise their price or forcefully offer you many unnecessary kinds of stuff. Let’s check it. We reviewed Jimdo premium users and also contacted many of its old customers. We got nearly 40% good responses. If you want to know more about people who already running their website with Jimdo, then see live Jimdo example websites of its real customers. Many famous people already recommended Jimdo. Its portfolio is good enough. Jimdo User Experience – Is Its Website Builder Easy For You Or Give You Headache? Do Your Skill Level Enough To Build Amazing Websites? Do You Get Many Problems After You Publishing Your Website? How Is Its Dashboard & Main Settings? How Much Easy? Let’s Walkthrough From The Beginning Quickly To Know Its Issues. Building a website with Jimdo is not difficult. You can make a website in 3 steps. Here I just gave a clue about how Jimdo is easy. If you want a detailed step by step tutorial, then read this one – How To Build a Website On Jimdo Completely. (There, you will get all the answers for your doubts those related to its ease of use). Go to Jimdo & click on Create a Website. Once you clicked, many ready-made website designs or templates will appear. You can select any template you want. Once you selected a Jimdo template, Sign up form will appear. You need to create an account with Jimdo. Once you created, Your site builder will load on your screen. Edit, adding elements, drag & drop the blocks many more things you can do. (But, a few cons are there. You can’t use any of its site builder functions in its style mode. I explained about it in Pros & Cons box below) After you finished your web design, you can publish by clicking on upgrade button. Note:-In this 2end section I explained only about the User Experience & I do NOT explain more about the templates. Because I discussed everything on Jimdo templates at the 3rd section of this post. To know continue to read. How Is Jimdo Dashboard & Main Settings? 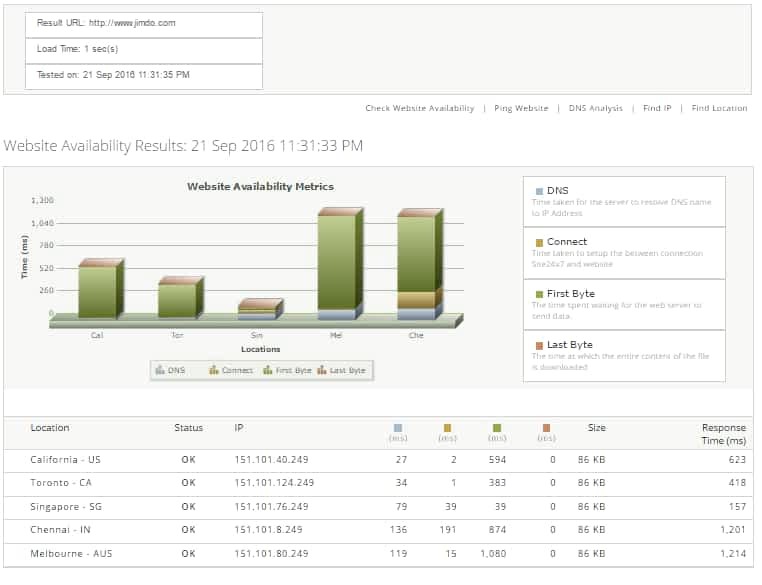 Jimdo dashboard is really good enough to run any type of websites. Take a look at its Dashboard settings. You can manage a website easily from one place. 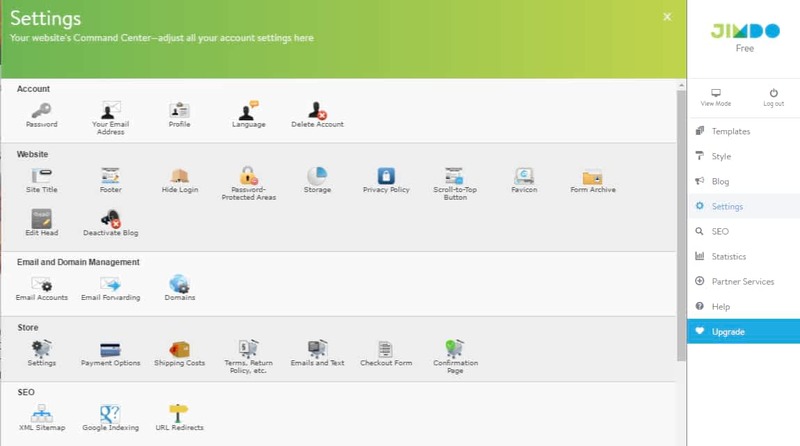 In Account section, you can change your password, email, profile, and language. Also, you can delete entire your account & information in one click. They give the highest level of user privacy. In Website section, You can modify your site title, footer, hide login (Protecting from hackers). Password Protected Areas option will help you to restrict users from any page and give permission only if they sign up for your website. In Email & Domain Management, You can get professional emails, email forwarding option & you can manage your domain name. Drag & Drop site editor. Good control panel, dashboard and important settings give you the maximum power to control your website. Jimdo site builder is available not only in English but many languages. See Jimdo supporting languages. You can add HTML & CSS codes. You can get Jimdo free trial. Jimdo Templates & Designs – Is Everything Good Enough Or Out-Dated? How is theme customization & flexibility? How your Jimdo website will appear on mobile, tablets and other different sized devices with different browsers? Do Its templates are developed with good codes? Below clear your doubts now. Does All Jimdo Templates Are Good Enough For You? We tested all its 40 templates. Its designs are modern & professional. You will get wide as well as boxed layouts. The only disadvantage is the limited number of templates. But if you invest a little time to design your website by adding its elements and using all its functions, you can make an amazing site. Are Jimdo Templates Really Developed With Good Codes? Yes/No? We tested all Jimdo templates coding structures. See below a sample of our test. In the below screenshot, you can find the test results of an example of a Jimdo Template. 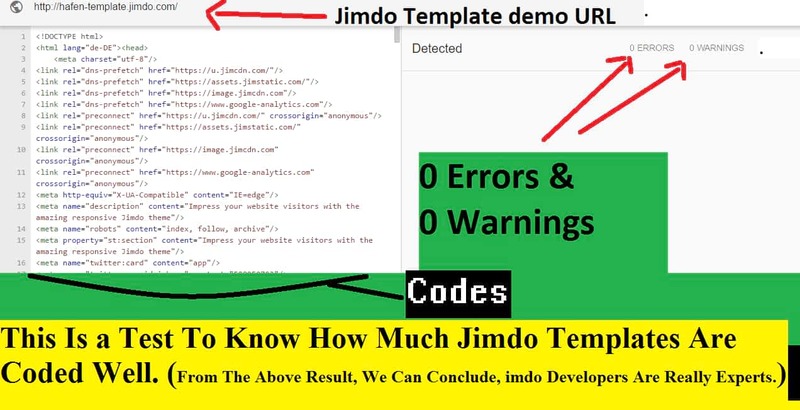 Jimdo Templates Structures back-end test to know how coded well. Templates Structures back-end test to know how well coded. This result showed no zero errors and warning. From the above test, we can conclude, Jimdo templates are developed with good codes. Jimdo template mobile friendly test, mobile speed test result. From the above test result, we can conclude, Jimdo templates are mobile friendly. It got 99 out of 100. It is a really good score. But its mobile speed is very slow, even desktop speed is also not good. Website speed depends on its template codings as well as its hosting. I discussed more on Jimdo website speed in the 5th section of this post. Jimdo Templates Flexibility – Will You Get Full Freedom? In Jimdo Design You can sort templates in a very flexible manner. Look at the below screenshot, Just select what type of elements (header sections, navigation, content area, sidebar, responsive) you want to include on your website. Then the perfect templates will appear for your needs. If you don’t satisfied with any of those themes, you can get customized templates according to your imaginations from third party services. But you need to pay for it. Finding the right template is very easy & flexible. In Jimdo Design You can sort templates by header, navigation, content area, sidebar & responsive. In Jimdo templates, you can sort by business, store, portfolio & personal. You can change any templates at any time without losing your previous work. 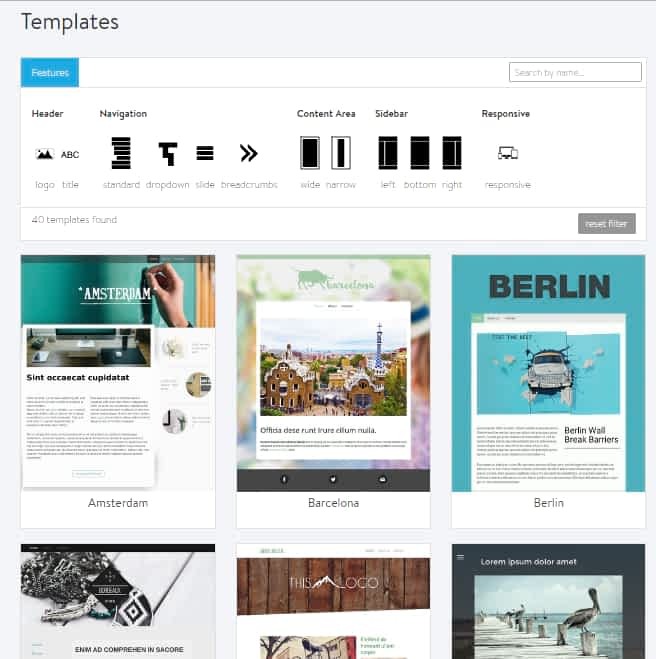 Changing the template will automatically fit with your old designs, contents, uploads & everything. You can also change any templates after you published your website. Only 40 templates are available. If you change your template, it will not change entirely. The background and some more things remain as it is. Templates are very similar. Most of the designs are unprofessional & not much attractive. It may affect your potential visitors or customers. Jimdo Website Builder Features – Do You Really Get Magic Tools? What you can do with Jimdo? Using its Style Features, you can change your entire website’s colors and fonts. You can switch for the entire site or block-wise to change its colors and fonts. If you know HTML programming, you can add HTML codes in any text editor. It included all essential elements like Heading, text editor, media, columns, buttons, share, Store items. You can add entire gallery or photos with text or single images. You can add comment box (Guestbook). It included basic functions like moderate, Captcha, comment order, email notification and discussion active. Using store catalog, you can sort your items by tags and names. Widget/HTML help you to add your own HTML codes or third party apps codes. Using form, you can create a contact form in a single click. So that, you can get touch with your site visitors without revealing your email address. You can create tables. You will get all necessary options like adding rows, columns anywhere, text, links and much more. You can add facebook like box, Twitter follow bar, Google plus profile, RSS feed, Instagram feed widget in a single click. Also, you can customize your social box appearance. You can add Newsletter signup box to get your site visitors email. It will help you in email marketing. Search box helps your visitors to search items or blogs within your website. Google Calendar will help you to manage events or anything those are time sensitive. You can create appointment booking system on your website. Also, you can add live chat system. You can add all POWr plugins to your website. It included 50+ plugins. There you can add anything you want. You will get all text editing options in blog writing. You can choose your blog layouts. there are many blog layouts with category-wise. You can tag your blogs. All Jimdo’s website builder functions, elements work well with the blog. In setting, you will see all eCommerce options under store section. The main setting included SEO, tax, Currencies, Country, item shipping details, Store catalog styles and more. Paypal settings including credit card, debit card and bank transfer. You can add shipping costs by destinations. You can Customize checkout forms. You can set up Confirmation Page. POWr plugin gives you more power to add any function you want. Jimdo Web Hosting – Does It Runs Your Website In a Good Manner? Is It Runs Your Website Smoothly? What It’s Up-time? Jimdo passed in our Uptime test. From the above result, we can conclude its web hosting uptime is good. You no need to worry about its up time. Jimdo Security – How Really You Will Be Protect From Viruses & Hackers? We tested its security. Here is our result. 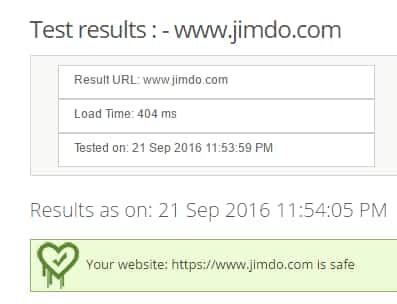 Jimdo security tests results revealed its websites are safe. You will be protected from any viruses or malware. Domain: You will get a free domain name. In setting, a Separate domain name management option available. There you can add, change or redirect from any domain name. Do You Get Professional Emails? Yes. You can get free email accounts with your own domain name ending. Import & Export : There is no option for export or import. That means you can’t transfer your website if you don’t like Jimdo. Jimdo SEO:– You site will appear in all major search engines. Separate SEO settings are given. It will help you to get your site on Google index in a healthy manner. Website Speed:- Jimdo website speed test result showed it is faster than only 27% of all tested websites. All our top website builders showed more than 90% faster than all tested websites. This revealed Jimdo web hosting will not boost your site loading speed. Your site will get slower than 73%. Good up time & Enough capacity to run any type of websites. Good SEO included xml sitemap. Automatically index in all major search engines. No backup option. If you got any problem to your website, you can’t restore. However you can use third-party services, but beginners can’t understand easily. No import & export option. Website speed is very slow. Its web hosting servers will not help to boost your web page loading speed. Jimdo Support – Will They Really Help You? If you are a beginner, you need some help frequently while you are building a website. Let’s check how much you can get support from Jimdo team. In Jimdo support, you will get all guides, FAQ’s, video tutorials and more. If you got any problem, there you can get the solution. How to contact Jimdo customer care? This link Jimdo contact carry you to the customer service page. There you can send your problems to Jimdo customer care team. Jimdo will not provide you phone support. Also, you can’t get 24X7 support even you purchased it’s the Jimdo business plan. There is no Skype option or chat or any file and screen sharing option to contact their customer care. Jimdo support included all guides and FAQ’a sections-wise. This is a great resource to build your website quickly without knowing anything. Jimdo Office addresses are given and they invited to their office if you want any personal advice or to discuss high-end business website. No quick supports like chat or video calling or screen sharing support. Jimdo Pricing & Plans – Is It Worth Your Investment? If you look at Jimdo pricing, you will see 3 different plans. Free, jimdo Pro & Jimdo Business. Free users can’t get domain names and also their website will not get index on Google or any search engines. Jimdo Pro is the best plan to start. It costs $7.50/month. Jimdo business pricing is $20/month. All plan’s amounts billed annually. that means, if you want to purchase Jimdo pro plan, you can’t order for one month, you should buy for 1 year. That costs you 7.50X12=$90/year. Jimdo pro plan is best for beginners who just want to build their personal website or any artists, design related websites. Jimdo business is fit for eCommerce or if you are very confident to get a large number of visitors to your website. According to me both Jimdo pro & business plans are not worth-able to its price. Jimdo business plan is too costlier to its services. Because there are many website builders provide more business services with cheaper than Jimdo. If you don’t care just $30-$50 differences, then you can try Jimdo. We invited many web designers & web master to review Jimdo on our website. When To Use or For Whom Jimdo Is Ideal? If you are a dummy and you want to make a simple website, then you can try Jimdo. If you want to start an online store, then don’t see at Jimdo. If you need a portfolio like website, then it may not fit for you. If you are a dreamer and you want amazing animations, effects, professional & modern look, then Jimdo will not satisfy all your imaginations. Jimdo is one of the top website builders in the world. But it has its own limitations. Every service starts with to provide a solution. Most of the time, that solutions may not fit for all. If you think, Jimdo is not for you, then see another site builder review. If you are in confuse, leave a comment below. I will help you.